When the famous naturalist Sir David Attenborough was invited to choose which ten threatened animals he would save from extinction, one that he placed on his list was the mysterious pangolin, the only mammal on the planet with scales. “It’s one of the most endearing animals I have ever met. Huge numbers of them are illegally exported, mainly to China,” said Attenborough. He discovered it after rescuing one from a cooking pot in Asia during the filming of a documentary. Here we review what makes this animal so different and so coveted. A giant ground pangolin. Credit: David Brossard. What makes the pangolin so special? The truth is that almost everything about this animal is special, from its unique appearance—which has earned it descriptions such as an “anteater with scales” or an “artichoke with legs”—to its comical and humanoid ability to stand on its two hind legs and, with the support provided by its powerful prehensile tail, wobble forward. This makes it one of the few mammals—along with humans and some primates and kangaroos—that practice bipedalism. The pangolin is also the only mammal with scales—similar to those of fish and reptiles, while the shell of the armadillo is bony in nature. These scales form an armour that covers the top of the head, all the back and tail, but not the face, throat, belly and the inside of the legs. It serves as protection against its predators: when feeling threatened it rolls itself up and becomes an armoured ball. The head of the pangolin is small compared to the body, and elongated. It has a tubular snout and a toothless mouth, with a narrow, muscular and sticky tongue—lubricated by huge salivary glands—which it inserts into anthills and termite mounds to feed on tens of thousands of these insects daily, digesting them with the help of small pebbles that accumulate in its stomach. Its tongue is as long as the whole body and is attached at its base to a pelvic bone. When not being used it remains wrapped in a kind of pocket or bag inside the throat, which greatly limits its ability to vocalize. In fact, pangolins communicate with each other by chemical signals that secrete through special glands, taking advantage of an extraordinary sense of smell, which makes up for its poor vision and hearing. Are they related to armadillos and anteaters? Although for a time the pangolins were grouped together with armadillos and anteaters in the Edentata superorder, it is now considered that the similarities and parallelisms between one and the other are the result of a process of convergent evolution. 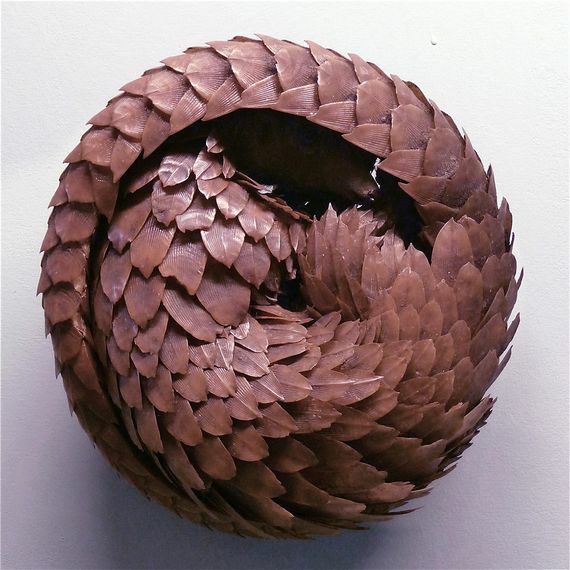 In fact, pangolins are so unique that an order has been defined, Pholidota, composed only of the eight known pangolin species: four Asian and four African, including the giant pangolin. These species differ, in addition to their place of origin, by their size and by their way of life—either arboreal or terrestrial: the smallest species (arboreal) barely reach 2 kg, while the giant pangolin (terrestrial) can exceed 30 kg. Why are pangolins still a mystery? It’s because there are still many aspects of their nature and behaviour that are unknown: how they pair and mate, how long gestation lasts, how long they live in the wild or if their behaviour is more or less territorial. This is because they are very shy animals, lonely and nocturnal; when they are forced to live together or are torn from their environment and moved they become greatly stressed, develop ulcers, stop feeding, become aggressive and end up dying. And the worst thing is that, at their current rate of disappearance the pangolin will eventually become extinct without many of these questions being answered. Why have they become such widespread victims of animal trafficking? This is due to the growing and massive demand for these animals from Asia, especially from China and Vietnam, where large sums are paid for their meat and scales. Behind this increasing demand is the economic growth in both countries, in which eating pangolin is a demonstration of wealth. Thus, wealthy businessmen go to exclusive restaurants in the company of friends and colleagues and order a live specimen, which is presented at the table before being sacrificed before the diners. This makes it clear that their businesses are booming and that they can afford to splurge. 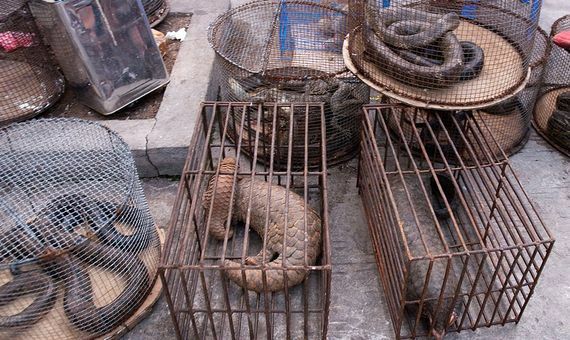 They pay up to $1,000 for a live pangolin and $300 per kilo for the meat. 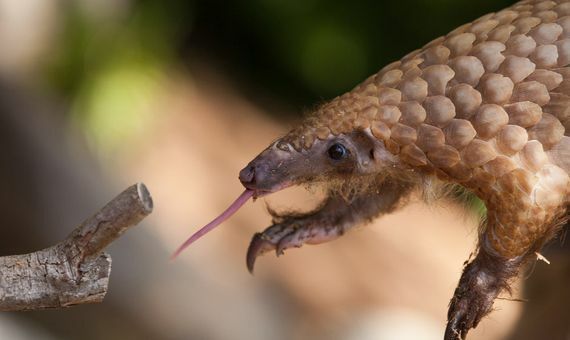 A large number of the pangolins captured in Asia go to restaurants, which in turn has caused demand to move to Africa—the other continent where there are pangolins—which has become the second largest market and supplier of these animals. However, due to the extreme sensitivity and stress that they suffer and which prevents them from surviving the shipment to Asia, African pangolins are mainly used for meat markets and for the supply of scales to traditional medicine establishments, where they reach $3,000 per kilo. What is special about pangolin plates or scales? The different traditional eastern medicines attribute all kinds of virtues and healing powers to them. For example, the official treatise of traditional Vietnamese medicine recommends them as invigorating, to improve blood circulation, cure ulcers and promote the secretion of breast milk, and also to treat acne and scrofula. Other traditional medicines prescribe them as a cure for arthritis and even cancer. What measures are being taken to curb this situation? 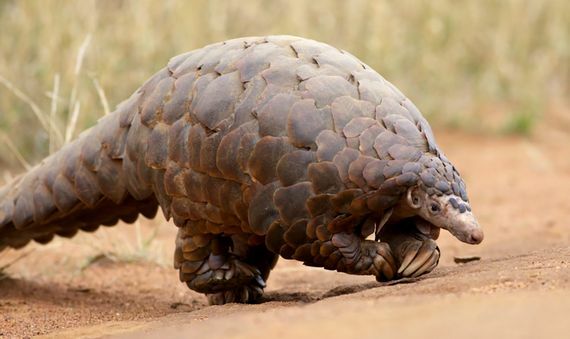 So far, the 182 nations that have signed the Convention on International Trade in Endangered Species (CITES) have reached an agreement for the total ban on trade in pangolins. In addition, and led by Attenborough himself, a media campaign has been launched to raise public awareness and save the pangolin.